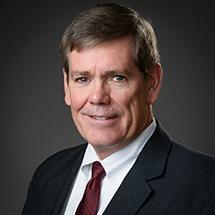 Chip Brown is an accomplished litigator with more than twenty five years of experience representing clients as lead counsel in complex commercial and technology disputes, many through jury trials and appeals. Chip focuses his practice on intellectual property litigation and client counseling. He has represented a diverse set of clients from small businesses to large corporations. Chip has extensive experience litigating patent, trademark, copyright, trade secret, and unfair competition claims in state and federal courts throughout the country. He has handled patent infringement cases involving a variety of services and products, including prosthetics, juvenile products, synthetic fuel technology, ventilation duct technology, beverage packaging, post-operative warming blankets, fuel nozzle technology, RV bed design, formed concrete technology, conveyor roller construction technology, and bill of lading processing and transmission technology. Chip also counsels clients on strategies to safeguard commercial applications for innovative technologies using patent, trademark, copyright and trade secret protection, licensing and enforcement practices. He has streamlined and revised corporate policies to better protect confidential business information including drafting non-disclosure and non-compete agreements. And he has successfully shutdown rogue websites containing infringing or defamatory material. Chip has tried numerous injunction cases for trade secret misappropriation and unfair competition to successful conclusion.